Hi guys! 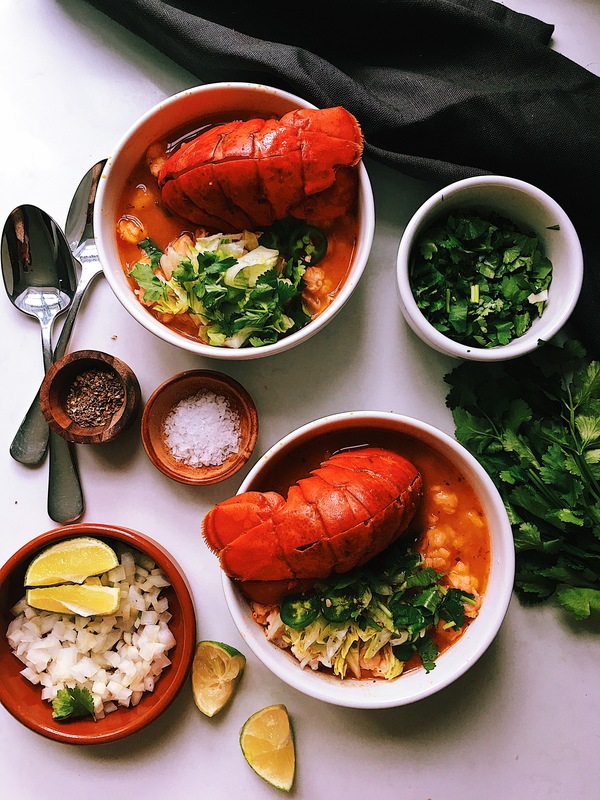 Welcome to a new week, it is Monday and the weather in London is not great, as usual, but as you probably know, Mondays for me are special because my husband, el inglés, stays at home to work, so I always try to make something extra yummy on this day and today I thought to combine two of his favourite things, pozole & lobster, he loves pozole and seafood, so cooking pozole with lobster makes this Mexican dish extra luxurious! It is very easy to make, especially if you can get precooked pozole maiz, so you will have food in 30 min. If you want to make your own fish or seafood stock, all you need to do is cooked the lobster’s heads with some fish bones and vegetables on the list, water, salt, peppercorns, bay leave. Bring everything to a boil at high heat, then low the heat down, let it simmer for 30 min. Pass the stock through a sieve. Set aside. Using a blender, blend the tomatoes, onion, garlic, chipotle chillies and 1 cup of seafood stock. Blend until you get a smooth consistency. Then in a saucepan, heat the oil, add the sauce, if you want to you can pass the sauce through a sieve. Then let the sauce cook for 20 min. Check if it is well seasoned, add the dried oregano then the rest of the stock. Continue simmering. Chop all your veggies that you are going to use to garnish your pozole. Rinse the pozole grains. Add them to the broth and together with the lobster tails. Cook for 7 min and turn the heat off. Serve in a bowl, put on lobster tail per person. Scatter some lettuce, fresh coriander, chopped onion, fresh jalapeños and squeeze a lime. Enjoy! *Note: you can leave the lobster tail in whole or remove it from the shell and cut it in pieces. Karla, qué delicia has hecho! Me encanta! Suena como un “seafood bisque,” pero 10 veces más rico! Disfruta tu día con tu amor. Nos encantan los mariscos!!! Gracias, Karla! I love your blog, you really have some cool recipes.. Thanks for sharing, I can’t wait to try this Pozole..